With the US 2016 election hotting up, I wondered yet again how difficult it is to vote in the US. This records my attempts to find out. Center for the Study of the American Electorate. 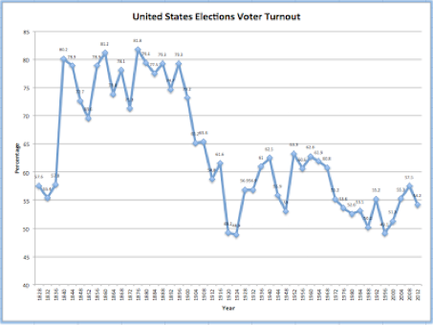 US turnout at elections is quite low, at 54% in 2012 (UK 61% 2015, France 71% 2012). 42% voted in the 2014 mid-term elections, the lowest since 1978. But that is a small part of the story, because there is a difference between being a citizen and being registered to vote. The Source for this gives quite a bit more breakdown of who it is that is voting. Oregon changed its rules in a different way: when you register with the DMV (for a driving licence), you are automatically added to the electoral register (you can opt out). This quadrupled voter registration. Many Americans simply don’t have the right type of ID to enable voting to occur; N Carolina, Wisconsin and Texas account for 1.2 million such folk. States with closed caucuses and/ or closed primaries deny an apparently large proportion of younger voters (Brennan Center). In North Dakota you don’t need to register, you simply turn up on polling day with sufficient ID. Simple. • inadequate ID (e.g.Texas, Wisconsin, North Carolina). 1.6M registered voters don’t have a current government issue photo ID (Brennan). There is a waiting time to vote (I have never had to wait to vote in Britain). A significant number report waiting more than 30 minutes and those waiting are significant in terms of population segment. (Brennan). Personally, having to wait might well put me off voting at all, as that would, in all probability, change the experience from positive to negative. In a country that professes to democracy, voting is not only a right, but the system should make it a safe, easy, and above all a positive experience. By comparison, that is all part of voting in Britain, and I’d love to hear from people with a different experience. I’ve missed a vote only when abroad (my fault for not planning ahead) and I consider it part of my civic duty to vote. What is required to vote in the USA? You must have a permanent address. More than 10% of US residents moved in 2011-2, not evenly distributed across income groups. At student age, around 25% move in any year (Guardian). The average American moves every five years (census). You must be a registered voter. That can (60%) be done online, but it is your problem, not that of the state. There is a registration deadline, but if you have the time there are work-arounds. You must be eligible (US citizen, over 17, resident special cases if in the forces or working abroad), not a felon (it varies). You might indicate a party preference, which affects primary elections. At the polling station you have to prove who you are with adequate ID (many states). The differences in Britain is that the state tries hard to have you registered and it happens automatically on change of residence, including moving to university; many of the bureaucratic systems are inter-connected, though we could go a lot further down that route. A caucus is a meeting or series of meetings in which voters express (visibly) support for candidates. Usually restricted to registered voters with party affiliation. A primary is a vote for a candidate of a party within ‘your’ state. An open primary includes all registered voters, a closed primary includes only affiliated voters and there are some that fall in between, semi-closed. None of this sounds particularly difficult, and no harder than, say, registering to receive a utility service. Perhaps then the issue is to do with the business (effort, time, reward) of keeping oneself registered and the experience of actually expressing a vote? Discovering that Americans move frequently and that residence must be somehow permanent suggests to me that many must feel disenfranchised. I do not understand how the patterns of registration correlate so strongly to income. While I see how low income might correlate with mobility in the US, I do not see how it is that this mobility correlates so strongly with income, nor why there is a perception that one connects to the other. Low registration among the low income earners is a separate issue from mobility, which is far more about maintenance of registration. The equivalent to primaries and caucuses in Britain is all included within being a party member and voting at candidate selection stage, something with a low uptake, under a million (1.6%) across all parties, but double what it was in 2013 (see). Parties elect their leaders from within, possibly from subsets of the membership (such as only the elected MPs, or with a distributed vote. The several British parties behave differently. Effectively, in Britain you must be active politically to affect who stands for election, but virtually all adults do nothing but vote to elect their representative MP, roughly one per 70,000 people. Other voting would be for local councillors, each of which will represent a much smaller number of people, around 3500. Increasingly we elect a mayor for our local region, a unit of variable size (see table here); we will have 23 of these by the end of 2017. I say that we see a failure of democracy, and at several levels. Both democracy failing us in several ways and to a lesser extent that we are failing democracy. Though that assumes that democracy is what we want. It is what we say we want, and therefore it behooves us to be clear what it is that we mean. I reassert that democracy is not equal to a vote in an election. • Registration needs to become largely automatic, such as being connected to application for a driving licence. That would not be a complete solution, but the evidence such as from Oregon and North Dakota is that it has a significant effect upon eligibility numbers. Quite clearly the Establishment is not in support of change; the median voter in 2008 in terms of income was at the 66th percentile for the general population (Aljazeera). Only the relatively rich people vote. A change in how registration occurs moves the problem from an inability to vote to wish to vote. • Voting itself is an issue; this should not be a bad experience and waiting even 10 minutes is a disincentive to voting, let alone 30. Again, this is unequally distributed across segments of the voting population, adding to disincentives to vote and exaggerating differences. That is not an indicator of a welcoming, open democracy, but far more somewhere where difference matters. Hugely. It is one thing to self-select (choose) to not vote, but quite something else to feel denied a vote, or to feel that one’s vote is irrelevant, or that the voting process is in any sense dangerous. • It is not in the interests of the established parties to cause this to change. That is a failure of democracy of a different sort of significance, suggesting a likelihood of catastrophic change in reaction to suppressed frustrations. People who allow themselves to think should worry about what it is that ‘democracy’ has come to mean in their country and what it is that they should do to help their national system to become more democratic. • Churchill was right when he said “Democracy is the worst form of government except for all the others”, but that does not mean that we should fail to ask whether our systems could be improved. Particularly, we fail to have democracy when very few vote, when those that vote are a distinct subset of the population – that could be a good thing, but not when that subset is self-serving in its uses of the apparent democracy. I have written elsewhere about Brexit and the apparent parallels between that and the current election furore. I have written separately about the press, how and why it fails to communicate political issues (what was said and subsequent spin but too rarely supported by independent thinking and data). And, the Donald was elected, much as I expected. See Essay 211 for the background on the financial crisis of 2008, which must go a long way to providing the groundswell of dissatisfaction with status quo that is used to explain his success. One cannot expect the people en masse to simply absorb what amounts to wide-spread corruption. A separate essay will attempt to discuss the term ‘post-truth’, which apparently permits politicians—and yet again the Brexit and Trump campaigns provide the primary evidence—to tell blatant lies and do so repeatedly while still somehow appealing to the electorate. 1 A source that agrees with me about embedding links in writing, but not going quite as far as directing you to the originating info site. I point to where I read it, not to original sources unless I’m annoyed enough to bother to search. Usually I end up frustrated at the lack of ‘genuine’ (clearly unbiased) data.